William Murphy | Demonstrate - TheUrbanMusicScene.com | Music Reviews! When the most respected praise and worship leaders finds themselves in troublesome times or finds an inspirational thought that sincerely affects them personally, their wherewithal to reach for their pen to birth special songs is meant to overflow in a positive direction. 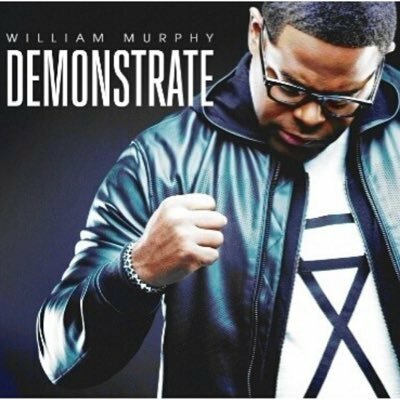 William Murphy is quite the confident worshipper since he was introduced in 2005 through “Praise is What I Do,” written during a difficult transition with his family. This signature piece was first featured with Shekinah Glory and Murphy as the lead vocalist and was released on his solo debut, All Day. The further proof of his strong prophetic ministry is in the Detroit native’s four CD’s, two of them released independently, which have all charted in the Billboard Top 25 Gospel Charts. This worship leader who currently calls the dReam Center in Atlanta his church home thrives on what he deems “The Sound,” inspired by the title track of his second CD, where he invites the congregations to step into God’s presence with a mix of gospel, pop and rock. On his latest RCA Inspiration release, Demonstrate, Murphy’s unapologetic approach to communicate God in all of his glory remains intact on most counts. Besides his band and vocal ensemble, two longtime regulars from Murphy’s previous work, Tasha Cobbs and Nicole Binion, return once again in two of the duet appearances. In a quieter spirit, Murphy’s softer, velvety voice continues to uplift on “Bow Down and Worship” and “Grace to Overcome” exudes the same passion: “When I was under/He gave me the grace to overcome.””Your Love” illustrates the perfect freedom when believers exercise their faith: “Now that I’m free, I can be who He called me to be.” Binion adds a soulful dimension to “Let Us See Jesus,” which focuses on the miracles of healing. Through Demonstrate’s triumphant praise and worship zone, Murphy unfortunately chooses to detour on “Light It Up/Because He Lives,” where he coaxes the congregation to hold up their cell phone lights, but instead could have concentrated in singing the latter Bill Gaither classic in full with just as big an impact. There is, however, a moving touch of gospel blues with “When I’m Weak, I’m Strong”: “I won’t fear tomorrow/I won’t fear any foes/I will stand in victory.” The R&B flavored, “Lies,” and “Free In Deed” that is anchored by these profound words: “Your behavior and your attitude will be a reflection of your freedom,” provides some genius moments of praise that keeps the gospel messages in perspective. In essence, most praise and worship live experiences tend to wonder off the beaten path. Yet Demonstrate does not consistently fall into this trap, thanks to Murphy’s songwriting and musical gifts. Three and three-quarters out of five stars.